In most Assembly of God churches when Christmas falls on Sunday, we will cancel Sunday School and the PM service. But we will have a service from 10:30 to about noon. And I have the first comment. And whats su unusual about that in an AoG church. I know cause I grew up in one. Really? When I went to a Hyles church, we had services no matter what the holiday and no matter how hard it was snowing (blessgawd). I’ll have to admit I’ve never attended Hyles churches with any regularity. In the circles I traveled, the rule was usually to cancel. No cancelling ever hereabouts for the IFB’s on Christmas Day or days close. Our Church usually had/has visitors as a result too. Had been there for 15 years and I agree. Bless God no one, no how is going to stop a service at the old church downtown. No exceptions. Ever. Is HB = Hammond Baptist? So church is named First Baptist, & School is named Hammond Baptist? Not that it’s like the worst thing they ever did, that’s odd though. I went to a First Baptist school run by First Baptist Church. I’ve been to a Hammill Road Baptist School run by Hammill Road Baptist Church. Did also attend a Hope Christian School (Baptist, but not named so) run by Edgewood Baptist, so they aren’t the only ones who do diff named school church, but it’s odd, and I’ve always wondered how that happens. Out in the rural areas of NC services were only cancelled when they actually fall ON Christmas or the 4th of July… no other holidays rate this treatment and Christmas will have an extra Christmas Eve service to make up for it while the 4th is subject to cancelling only the evening service. In the rural bunkers where only 20 to 50 people show up regurarly anyways the M-O-g’s ego is stroked if more than he and his family show up on these days and he counts it a success of the power of HIS ministry when folks show up for these special services. The fundy churches I attended NEVER canceled a church service for Christmas. After all, if we’re celebrating Jesus’ birthday, why would we ignore the guest of honor? We didn’t even cancel school when the temperatures were at freakish record lows. We were expected to be there when those doors were open, and even our safety didn’t matter. We have a Mass on Saturday night and three on Sunday so you have plenty of options! I’m going tonight and am looking forward to it. I don’t remember Church being skipped when I was a child but I do remember some mega-church canceling services several years ago. I don’t remember Church being skipped when I was a child but I do remember some mega-church canceling services several years ago and it made the news. I thought it…strange. In my experience they were quicker to cancel services for a Sunday Christmas or a Sunday Christmas Eve than they were for potential life-threatening weather-related road danger. The members who foolishly risked their lives to get to the church in the blizzard were of course the most revered. your comment made me chuckle, and the same was true at my fundy assembly growing up. Put church first, amen bless gawd! And of course if you didn’t make it because of the weather, you were the object of the next week’s sermon. How the m-o-g couldn’t believe you wouldn’t be in church but probably went to work the next day. Yeah, OK. Whatever. Yep, same here. And, most of the sermon would be bashing those who didn’t show up (even though the preacher lived across the street). When Christmas falls on a Sunday, we do have one less service – because the Christmas morning service is of course on Sunday morning. But this year Boxing Day is a Sunday, and so we shall have two services on Boxing Day as well as one on Sunday morning. Cancel services? No! Even if I have to trek through the snow on foot and preach to two people (in my itinerant days I once preached to two people in the evening, and one of them worked the organ! They were of course married to one another). Last year we even picked some some extra folk when other churches cancelled services due to snow. It amused me that the church where the minister came in on a bicycle was the church where services were NOT cancelled. Even though I had a flat tyre that morning as well! Yeah, the concept of “wherever two or three are gathered…” seems to be completely lost. I think that verse ranks in my top 10 for most misunderstood/abused verses in fundyville. I remember the fuss when my dad refused to cancel services on Christmas. This post is right on. A few years ago when Christmas fell on Sunday, we cancelled Sunday School and the PM service, but still held the 11:00 a.m. service. We sang lots of joyous carols, had all the children come up on stage to listen to a story and receive a gift, and made sure we didn’t run past noon. I thought it went well. When we first arrived at the church, my husband wanted to have a Christmas Eve service. The head deacon said he always got together with family on Christmas Eve so we couldn’t have one. My husband said, “You don’t have to come. 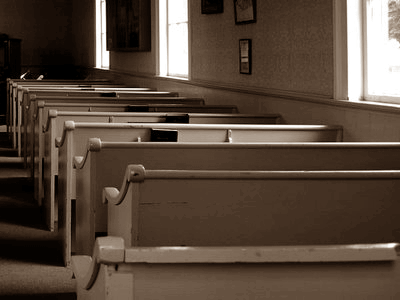 We’d still like to have one.” But the deacon would have felt SO guilty if the church had a service and he wasn’t there that he refused to let us have one (even though my husband and I have NO family in the area to gather with). I’ve been in five different fundy churches in my adult life. Most of them have cancelled church when Christmas was on Sunday. The ones that didn’t usually promised that the service would last for EXACTLY one hour. I love it that this was the only time of the year you could actually trust their promise to be true! There was one other service at the church that I went where that happened. I know of a Fundy church here in my undisclosed location that will be meeting for Men’s Prayer tomorrow night at 7pm sharp, because prayer is ALWAYS on the last Saturday, and will remain so until Jesus comes-Because we know God wouldn’t hear us if we went to Midnight Eucharist at the Lutheran church instead. Come out of the closet. It is SO MUCH BETTER outside. Hubby and I were closet Lutherans for close to 2 years before we stepped out and now have been attending a Lutheran church for what will be 2 years on Easter and we cannot remember what it was like going to a fundy church and having that as our normal. So what are our predictions for tomorrow – Day 12? Somehow this had never occurred to me. Definite irony of the typically un-self-aware Fundy variety. And I laughed like a maniac at the hypertext caption. We cancelled the evening service, but as I recall we met for the AM service and Sunday School. I always didn’t like how friggin MUCH we went to church. Guess its that heathen in me, but I think once aa week is good enough. We’re proud of you for being in AA, but really. George gets a little tipsy this time of year! The local Anglican church traditionally has two services on Christmas Eve. The one before dinner is the children’s Christmas pageant, which is punctuated with lots of hymns, mostly sung by the congregation. Then there is one late at night, ideally so late that it ends after midnight. That one is a Christmas vigil for adults, although some children may be sleeping in the back pews. We don’t have church on Christmas Day. However, we observe the entire Twelve Days. Call me a heathen, but I couldn’t stand Christmas Eve services, especially if they fell right before a weekend. The worst is Christmas on a Saturday, like this year. Long, boring service Friday night, then another equally long and boring service on Sunday where it’s back to John W. Peterson and John R. Rice hymns because hey, Christmas is over! And don’t even mention the horrendous New Years Eve service where people try to attach spiritual significance to the changing of the calendar. Ugh. Happy to report that I’m skipping the CE service this year, first time in my life, I think. I suppose I did ask. 🙂 And hey, just so no one gets the right idea, I like Christmas. I just don’t like Christmas in the Fundy tradition. George visits me today. That should be, “so no one gets the WRONG idea.” Humbug, George! Humbug, I say! There were only 3 holy days on our fundy church calendar worthy of church dismissal. ChristmasEasterAnniversary Sunday, the day we celebrated our MOg’s arrival to the church in 1969. The fundy churches I was involved in never cancelled on Christmas. But I always thought it was strange that they never had service on Christmas Eve or Christmas day, despite the fact that they were insistent that Christ was the reason for the holiday. That never made a lick of sense to me and my heart missed it. This is our second year in a Lutheran church, so our second year back to celebrating Christmas properly. I love it! the candles.. the liturgy.. the hymns.. It is wonderful. Christmas without church is just…weird. The churches I have been in have never canceled services because of holidays. The more level-headed ones would tell people to use their own judgement when there is snow and ice; and perhaps we had a few services canceled because of the weather. Some extremist churches encourage people to risk their lives on bad roads just to make it to church. Not good, in my opinion. You’re right. It makes no sense to harp on how it’s all about Jesus, then not go to church on Christmas. Just add this to the list of contradictions that can drive you nuts if you ever start trying to think them through. Unfortunately a lot of IFB churches aren’t much about Jesus. They’re about standards and Bible versions or detailed explanations of the end times. Maybe they don’t focus on what Jesus SAID because that would point out how much of it they aren’t doing. All the preaching He did on helping the poor (like His message on the sheep and the goats), the IFB dismisses as the “social gospel.” The Sermon on the Mount? That gets dismissed because it’s for the kingdom and we’re not in the kingdom. I wish more of the preaching I’ve heard in a lifetime in the IFB were extolling the glories and greatness of Christ. When I was growing up, we spent lots of time with family on Christmas, but it was decidedly arranged AROUND church. It was assumed in my big Catholic family that everyone would be going to some church at some point during those two days, so we never would be together at a time when service was going on. Growing up, I went to Midnight Mass and then again Christmas day at about 10am. I loved Midnight Mass because it was the one time that my family all went together. however, after my marriage, my husband and I spent about 10 years in churches that did not have Christmas services, so it was not a part of our Christmas routine. I always found it sad and stange that there was no church on Christmas. It has been hard to incorporate church on Christmas because we have been out of the habit and my husbands family gets together on Christmas Eve night. We are making it a priority, but now we are working church in around family and friends instead of it going the other way around. We left Christmas Eve night when everyone else was still partying. We felt bad. Christmas morning was beautiful though,. Glad we made the effort to wake up and go. The reason Christmas is December 25th is because of Catholics btw.. They protest advent because it is Catholic, but keep Christmas. I guess its okay as long as they stay out of church, eh? I like it. Not to mention the dismal attendence means a dismal offering; so, it’s best just to stay in bed. In my old fundy church we had Thanksgiving services, but no Christmas that I remember. Several loooong NYE services, ugh. But yeah, they don’t cancel church for anything. But Florida doesn’t get blizzards so that’s part of it. Every year the evening services on Super Bowl Sunday had less and less people. The last evening service (around 1980) had about 20 people, on the same Sunday the a.m. service had about 250 people. The next year there was no evening service. I guess Satan and the Pittsburg Steelers won. These comments made my day, though.